Moree Men’s Shed President Peter Sampson, left, Mayor Katrina Humphries, Col Murray, Northern Tablelands MP Adam Marshall, Ron Baker and John Officer at last Friday’s funding announcement. 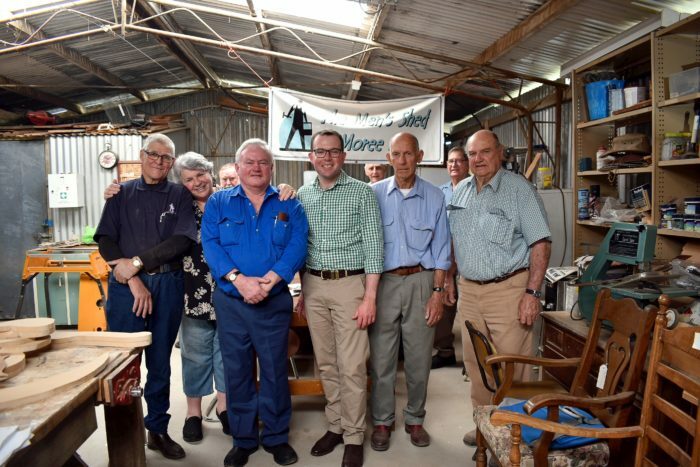 NORTHERN Tablelands MP Adam Marshall has delivered a new high water mark for the Moree Men’s Shed group that will see them get a brand new shed in a better and safer spot at the Moree Showground. Mr Marshall was in Moree last Friday to meet with members of the Men’s Shed and join Moree Mayor Katrina Humphries to announce NSW Government funding of $163,233 for the new Moree Men’s Shed. The grant will enable the group to relocate their activities with a new shed set out of the flood prone area it currently occupies at Moree Showground. Mr Marshall said the funding under the Stronger Country Communities program had been awarded to Moree Plains Shire Council to oversee the construction of a new shed. Moree Men’s Shed spokesman Col Murray said their members were over the moon with excitement at the funding. “We’ve got a shed at the moment that leaks, is in a flood prone area, and basically has nothing else,” Mr Murray said. Mr Marshall said the current temporary position of the Men’s Shed at the showground site was susceptible to flooding but a new home about 300 metres from the existing one would reduce any impact of future flooding – and importantly create a more suitable, sustainable and safer environment for everyone. The project will see an 18 by 24.1 by 4.2 metre Ranbuild shed constructed on a concrete slab and completed by local tradies. Mr Marshall said securing a new location and a new bigger shed was integral to the philosophy of the Men’s Shed movement as a listening place and a meeting ground for more people. “The decision by Moree Plains Shire Council to apply for funding on behalf of the group is a great solution for forward planning,” Mr Marshall said. “The Men’s Shed at Moree has put up $19,000 of their own to get this done and that’s a real credit to them. Councillor Humphries said the Men’s Shed plan was supported by the community, not only as a place for men to gather and work on projects, but also as a resource for the members to reduce isolation and combat depression that often sets in in tough times or after retirement or family grief. “Anyone who has been involved, or knows something of the Men’s Shed philosophy, knows just how valuable a resource they are when it comes to addressing the mental health and wellbeing of others,” Mr Marshall said. Mr Marshall said the current premises are more than 80 years old, have no heating or air conditioning, no toilet facilities and the water leaks through the roof and walls. He said the funding would give members the basic bones of a new shed, but they’d thrown up their hands to undertake the fitout and ongoing maintenance.